The Pound breaks below the 1.3035 support level as U.K Retail Sales disappoint. Year on year Retail Sales printed at 2.9% relative to the expected 3.7%. This number caps the week for a series of disappointing economic data from the U.K. Lower than expected wage growth, inflation, and retail sales means that the path towards a BoE rate hike in August is not as easy as the market believed at the beginning of the week. This claim is proven by the drop in the probability of BoE rate hike from 90.7% at the beginning of the week to 80.6% today. The break below 1.3035 and the release of the Retail Sales figure immediately pushed the pair towards 1.2960 but the drop didn't continue as the U.S Dollar began to weaken. The weakness in the greenback was attributed to Trump announcing his dissatisfaction with the Fed's rate hike policy. Following the break of the 1.3035, the pair dropped towards the 1.41 Fibonacci extension but then rose back up towards the broken support level (new resistance level). 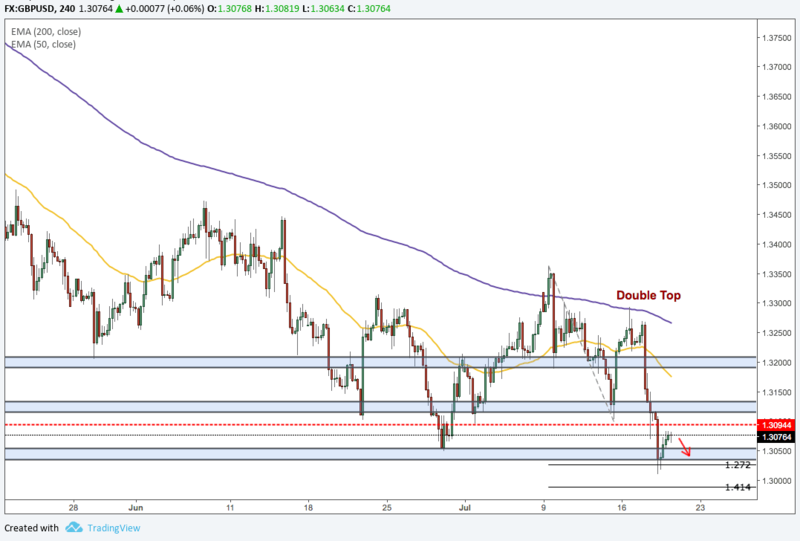 The bias remains downwards as long as the pair trades below the newly created resistance level at 1.3035.